Right to Life of Michigan is disappointed that Governor Rick Snyder vetoed legislation to create a Choose Life specialty license plate in Michigan. Right to Life of Michigan remains committed to creating the license plate. A record number of prolife bills have been introduced in Lansing this term addressing everything from defunding Planned Parenthood to protecting vulnerable patients from medical discrimination. Right to Life of Michigan applauds the commitment of prolife members in the Legislature who are making prolife issues a priority in Lansing. This entry was posted in Uncategorized on July 30, 2017 by editor. Dear Dr. Universe: Why do snakes shed their skin? – Kalitia, 12, Zimmerman, Minn. Believe it or not, pretty much all animals shed their skin. Some animals make it a bit more obvious than others. Snakes, and some other reptiles, will often shed all at once. Instead of shedding their skin in one go, humans actually make and get rid of new skin all the time. It floats away in very small flakes. If you’ve ever had a sunburn, you know skin can shed in bigger pieces, too. That leads us to a big part of the reason animals shed, said my friend Kenneth Kardong. He is a zoologist at Washington State University who is really curious about reptiles, especially rattlesnakes. He said animals shed to replace worn out or damaged skin. When a snake gets ready to shed, its eyes turn a milky color. This is because a new layer of skin forms over the eyes, too. It can’t see very well. It may even try to find a place to hide out until it starts shedding. For that to happen, it needs to find something to help break a part of the skin up near its snout. Something like a stick or a rock. Then the snake will start to wriggle out of the outer layer of skin. It slithers against rocks, trees, and plants. Some snakes will even go for a swim to help escape their old skin. In a snake’s shedded skin, we can see all the details of the original skin, its scales and even its eyeball cover. For most snakes, that’s the end of it. At least, until the next time they shed. That’s usually in a year or two. But rattlesnakes are a little different. Shedding doesn’t just get rid of their old skin. It also reveals new parts of the rattlesnake’s tail. The rattle is made of different sections of keratin—the same stuff that makes up your fingernails. Each time the snake sheds its skin, a new segment of the rattle is revealed. When a baby rattlesnake is born, it can’t make a rattle sound yet. It isn’t until the first time it sheds that a new segment forms on its tail. Together, these segments vibrate to make the snake’s “chica-chica” sound. As with other snakes, shedding also helps rattlesnakes repair any damaged skin. In fact, sometimes snakes have things called parasites. They’re creatures that takes away nutrients from their host animal to survive. Shedding helps snakes get rid of these creatures. And of course, the shedding also leaves the snakes with a brand-new layer of skin to wear out in the world. Ask Dr. Universe is a science-education project from Washington State University. Send in a science question of your own at askDrUniverse.wsu.edu/ask. This entry was posted in Dr. Universe on July 29, 2017 by editor. 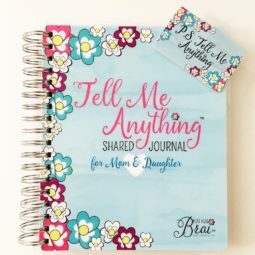 Mom and daughters create a shared journal that is being used all over to bring mom and daughter closer, and have a timeless keepsake forever. This entry was posted in News Releases on July 27, 2017 by editor. July 17, 2017 – 7:00 p.m. I. The Regular meeting of the Board of Education was called to order at 7:17 p.m. by Board President, Dave Hazekamp. II. ROLL CALL: Present – Jill Brott, Elroy Buckner, Tim Burgess, Kris Cole, Dave Hazekamp, and Steve Kelly. Absent – Susan Franklin. Item 17-092. MOTION by Buckner, SECOND by Brott to approve the agenda as presented. • Two Above and Beyond Awards were presented by Dave Hazekamp and Courtney Stahl. Shirley Hendricks and Eric and Heidi DeRuiter received them for their support of Beach Elementary. • Athletic Director, Ken Erny gave a brief highlight overview of the 2016-17 school year. He explained, this was the first year in the OK Black conference and even though Fruitport was the smallest district and only Class B school, the athletes finished in the middle of the conference. This year 13 school records were broken and Fruitport had 14 All-State athletes. Ken also mentioned the VNN (digital Varsity News Network) app and invited all the Hall of Fame golf outing on September 16, 2017. Superintendent, Bob Szymoniak discussed the ordering of business cards and name badges for the board. He also spoke about a conversation had with YMCA representative, Bruce Spoelman about a potential programming partnership. Item 17-093. MOTION by Burgess, SECOND by Brott to approve the Consent Agenda as presented. 1. Second and Final Reading of Board Policy 5630.01. Item 17-094. MOTION by Brott, SECOND by Cole to approve the second and final reading of Board policy 5630.01 (Student Seclusion and Restraint) per the recommendation of NEOLA. 2. First Reading of New and Updated Board Policies. Item 17-095. MOTION by Brott, SECOND by Buckner to approve the first reading of new and updated policies as follows: 168.1, 2221, 2461, 2623, 3120.04, 3121, 4121, 5111.01, 5111.03, 5610, 5610.01, 7540.02, 8305, 8330, 8340, 8400, 8500, and 8510 as presented. 3. Approval of the 2017-18 Athletic Coaching Handbook. Item 17-096. MOTION by Brott, SECOND by Buckner to approve the Coaching Handbook as presented. 4. Approval of the Request to Bid Pool Repairs. Item 17-097. MOTION by Brott, SECOND by Buckner to approve putting pool repairs out for bid in the fall when the bid climate is more favorable to fix mechanical/physical issues per the $180,000 estimate, plus adding a lift and updated lighting with a $5,000 contingency for an estimated total investment in the pool of $210,000. Once bids have been received, the Board will decide whether or not to award said bids. 1. Report of committee meeting held July 12, 2017. Elroy Buckner reported on a Business and Finance Committee meeting held July 12, 2017. Dave Hazekamp, Elroy Buckner, Kris Cole, Mark Mesbergen, and Bob Szymoniak were present. The committee discussed: Purchasing two replacement buses for the district’s fleet, Merit Pay, and ECC Prices. 2. Approval of the Purchase of Two Buses. Item 17-098. MOTION by Buckner, SECOND by Brott to approve the purchase of two buses from Capital City for $110,000. The buses are coming off a three year lease and only have 37,000 miles on them. 3. Approval of an Increase to the Early Childhood Center Daycare Rates. Item 17-099. MOTION by Buckner, SECOND by Brott to approve an increase of the ECC daycare rate of $5.00 per week per child as presented. Steve Kelly reported on a Personnel Committee meeting held July 12, 2017. Dave Hazekamp, Steve Kelly, Tim Burgess, Mark Mesbergen, and Bob Szymoniak were present. The committee discussed: Food Service/Transportation Tentative Agreement and Merit Pay. 2. Ratify Fruitport Food Service/Transportation Association’s Tentative Agreement. The Board of Education shall implement the maximum hard cap allowed by law for self only. 1. Report of committee meeting held July 12, 2017. Jill Brott reported on a Student Affairs Committee meeting held July 12, 2017. Jill Brott, Dave Hazekamp, Susan Franklin, and Bob Szymoniak were present. The committee discussed: District Goals, Board Policy 5630.01, the Athletic Handbook and Merit Pay. Discussion was held regarding Merit Pay. Kris Cole reported that the Village of Fruitport hired an attorney to write language prohibiting a dispensary in the community. 1. Business and Finance Committee will meet August 16, 2017 at 11:30 a.m.
2. Personnel Committee will meet August 16, 2017 at 7:00 a.m.
3. Student Affairs Committee will meet August 16, 2017 at 4:00 p.m.
4. Blue and White Night August 16 at 5:00 p.m. Item 17-101. MOTION by Buckner, SECOND by Brott to adjourn. This entry was posted in Fruitport Schools on July 25, 2017 by editor. I. The Annual Organizational meeting of the Board of Education was called to order at 7:01 p.m. by Board President, Dave Hazekamp. III. ROLL CALL: Present – Jill Brott, Elroy Buckner, Tim Burgess, Kris Cole, Dave Hazekamp, and Steve Kelly. Absent – Susan Franklin. Item 17-079. MOTION by Burgess, SECOND by Brott to approve the agenda. Item 17-080. MOTION by Buckner, SECOND by Cole to adopt all existing Bylaws and Policies of the Fruitport Community Schools as presented. Bylaws and policies are to remain in effect until such time they are modified by the Board of Education. Roll Call Vote: Brott, Yes; Buckner, Yes; Burgess, Yes; Cole, Yes; Hazekamp, Yes; Kelly, Yes. Absent – Franklin. Item 17-081. MOTION by Brott, SECOND by Buckner to reconfirm the District’s Vision Statement as written until such time it is changed and/or modified by the Board. Roll Call Vote: Brott, Yes; Buckner, Yes; Burgess, Yes; Cole, Yes; Hazekamp, Yes; Kelly, Yes. Absent – Franklin. Item 17-082. MOTION by Cole, SECOND by Brott to reconfirm the District’s Mission Statement as written until such time it is changed and/or modified by the Board. Roll Call Vote: Brott, Yes; Buckner, Yes; Burgess, Yes; Cole, Yes; Hazekamp, Yes; Kelly, Yes. Absent – Franklin. Item 17-083. MOTION by Buckner, SECOND by Brott to reconfirm the District’s Belief Statements as written until such time it is changed and/or modified by the Board. Roll Call Vote: Brott, Yes; Buckner, Yes; Burgess, Yes; Cole, Yes; Hazekamp, Yes; Kelly, Yes. Absent – Franklin. Item 17-084. MOTION by Kelly, SECOND by Brott to reconfirm the District’s Exit Outcomes as written until such time it is changed and/or modified by the Board. Roll Call Vote: Brott, Yes; Buckner, Yes; Burgess, Yes; Cole, Yes; Hazekamp, Yes; Kelly, Yes. Absent – Franklin. Item 17-086. MOTION by Cole, SECOND by Buckner to adopt a Resolution authorizing the Superintendent of Schools and the Director of Business Services to invest idle funds of the school district in accordance with Act 86, of the Public Acts of 1979. Roll Call Vote: Brott, Yes; Buckner, Yes; Burgess, Yes; Cole, Yes; Hazekamp, Yes; Kelly, Yes. Absent – Franklin. Item 17-087. MOTION by Buckner, SECOND by Brott to authorize the District to work with Thrun Law Firm, PC of Lansing; Miller, Johnson, Snell & Cummiskey of Grand Rapids; Scholten & Fant of Grand Haven; Secrest, Wardle, Lynch, Hampton, Truex & Morley PC of Troy; and LaPointe & Butler, PC of Okemos in various legal matters relating to the school district. Item 17-088. MOTION by Buckner, SECOND by Cole to approve $599 compensation per Board member for the 2017-18 fiscal year payable in three installments: the first to be paid in August 2017; the second to be paid in December 2017; and the third to be paid in June 2018. It is suggested that $200 be donated back to the district in some financial capacity. *2016-17 rates. Membership renewal form with new rates has not yet been received by the district. Item 17-090. MOTION by Brott, SECOND by Kelly to appoint Tim Burgess as the Board’s official liaison to Michigan Association of School Boards. The Organizational Meeting adjourned at 7:16 p.m.
July 24-29, experience the wonders of farm life in West Michigan at the Muskegon County Youth Fair! This fair is a place for family fun and community growth! Each year, kids all throughout the Muskegon area work hard on an assortment of projects and this is their opportunity to show the product of their hard work with the community. In addition to auctions, shows and competitions, there’ll be lots of free family games such as the Water Balloon Toss, Egg Run, Flying Chickens, Horseshoe Toss, Disc the Field, Toss the Pig, Horse Race, Feed the Horse and more! A full list of events can be found at the website below, or visit www.muskegonfairgrounds.com. Beginning this season, the Muskegon Clippers will now be part of the Great Lakes Summer Collegiate Baseball League! This extremely well established league has been home to many players who went on to play in the Big Leagues. In 2016 alone, the Great Lakes League had over 30 players drafted in the MLB draft, including the #11 overall pick, Kyle Lewis who played for the Lima Locos! This move to the Great Lakes League is a huge step forward for the Muskegon Clippers and will bring high caliber baseball to Muskegon! Sunday, July 23 and Monday, July 24at 7:05pm at Marsh Field, come watch as the Clippers take on the Monarchs. For more information, e-mail info@muskegonclippers.com. The Michigan Lighthouse Conservancy is offering tours of the Muskegon South Pierhead Light Mondays, Thursdays, Fridays and Saturdays in July and August from 1:00-5:00pm. The cost is $2 – $4. For more information, call 844-MLIGHTS or visit www.muskegonlights.org. Through September 10 of 2017, the Muskegon Museum of Art will present a once-in-a-lifetime exhibition of national significance: Edward S. Curtis: The North American Indian. Serene Yoga will be offering a new Summer Beach Yoga Series through August 31. Classes will be held Tuesdays and Thursday mornings from 10:00am – 11:00am and Friday evenings from 7:00pm – 8:00pm. $10 drop-in rate. Join Diana and enjoy the serenity of the Great Lakes as she guides you stretching and balancing poses while focusing on breath-work and relaxation. This is a mind, body, spirit experience for the whole family. This class is a biblical based perspective. Meet at the beach. Participants should bring a towel, sheet or yoga mat. All new participants will be asked to fill out liability forms (please come early on your first visit). Children under 17 need to be accompanied by a parent or guardian. Check with your doctor if you have any concerns prior to taking this class. For more information please contact Sereneyoga10@gmail.com or call 231-343-8381 (text for cancellation information). Come to the library to see the movie “Arrival (PG13)!” This 2016 American science fiction film directed by Denis Villeneuve is based on the 1998 short story “Story of Your Life” by Ted Chiang. The film stars Amy Adams, Jeremy Renner and Forest Whitaker. A linguist tries to communicate with aliens who have suddenly arrived at various locations on Earth. Bring your own snacks and non-alcoholic beverages. The movie runs 116 minutes. For more information, call 231-722-8000. Come to beautiful the McGraft Park Bandshell for a series of free, family friendly concerts this summer! All concerts begin at 7:00pm. For more information, call the Muskegon Parks Department at 231-724-6991. Wednesday, July 26 from 5:00pm – 9:00pm, bring the family and your appetite to the Muskegon Farmers’ Market for the big Food Truck Rally! The second rally will include 21 local food vendors and music from Yard Sale Underwear! Fatty Lumpkins, Bone Ends, Hab’s Good Eats ‘n Treats and Ice Box Brand, and others will be part of the event. Entry to the event is free, but those seeking to buy food must purchase tickets from volunteers or at the ticket window. The amount of tickets for food will vary depending on the vendor. Be sure to bring lawn chairs so you can relax and enjoy an evening of games, live music and excellent food from your favorite vendors. For more information, call (231) 724-6777. Wednesday, July 26 at 7:00pm, come to the Book Nook & Java Shop for “Classical Night: The Indian Picture Opera!” This film is a journey through history as famed photographer Edward S. Curtis explains Native American cultures in his own words and photographs. This motion picture reconstruction of his 1911-1912 magic lantern slide show illuminates a time when Native Americans were forced from their land and cultures. Curtis’ documentation of Indian cultures serves as a unique footprint in time. Be sure to check out the Edward S. Curtis exhibition at the Muskegon Museum of Art, on through September 10, 2017. Come early for dinner and the best seats at 6:15pm to enjoy barbecued ribs, potato salad, coleslaw and a dinner roll for only Roll $9.25. For more information, call 231-894-5333. Thursday through Saturday, July 27 – 29, everyone is invited to downtown Holton for the 37th Annual Holton Days! This is truly an old fashioned treat of a festival featuring pie auctions, kids’ games, tractor pulls, cloggers, a chainsaw competition, a Grande Parade and even and Elvis impersonator. For more information, call 231-747-5945 or visit the website below. The Muskegon Area District Library’s Thursday Night Music Club will featuring the band Silverado, July 27 at 7:00pm! It’s summertime and the living is easy! Join your fellow music lovers for a free concert featuring Muskegon’s own favorite country/western music band. Weather permitting, the music will be outside at the Library, providing plenty of space to dance to your favorites in the summer breeze. The Friends of the Norton Shores Library will be grilling hot dogs and serving ice cold lemonade, so bring a lawn chair and join the fun! For additional information, contact Alison Purgiel, lead librarian, at 231-780-8844 or apurgiel@madl.org. For more than 30 year’s Parties in the Park has been a Muskegon institution providing Friday evening entertainment, free admission and a family-friendly atmosphere! Be a part of the tradition and enjoy a summer evening with us downtown in Hackley Park. There are always five local Muskegon food vendors at every party, there’s something for everyone to purchase. July 28, the band is Jaded 8, hosted by the Muskegon Area Sports Hall of Fame. Happy hour is from 5:00pm-6:00pm with the night ending at 9:00pm. For more information e-mail info@partiesinthepark.com. Friday, July 28 at 7:00pm, come to Downtown Whitehall and Montague for the CRUZ’IN Classic Car Show! Cars cruise from Whitehall to Montague where they will be on display in the downtown area. They’ll also have a DJ, food and fun for all. Over 400 cars are anticipated! For more information, call 231-893-1155. July 28 at 7:00pm, come to the White River Light Station for live music from Bob Hausler! Bob is an award winning singer, songwriter, guitarist, and entertainer who has entertained thousands of people in his career. As a session guitarist, he has played on hundreds of recordings. As a songwriter, his songs have been pitched to or recorded by artists like: Alabama, Jon Anderson, Randy Travis, Laurie Morgan, Laurie Middlebrook, Cheryl K. Warner, and others. He is currently working on his second solo recording project. This will be a follow up to the 2014 release “Family, Friends, and the Good Life. An emotional singer, Bob loves to let the song come from the heart. At home in front of a crowd of thousands or in the intimate setting of a small club, he performs with energy and soul. Known for his high-spirited performance and endless energy, Bob reaches out to his audience in a very personal way. As the founder and former president of the Mid-Michigan Songwriters Guild, he spends a lot of time helping others develop their songwriting skills. For more information, call (231) 894-8265. Friday night, July 28 from 7:00pm -9:30pm, enjoy a lovely dinner/dance aboard the Port City Princess. They’re offering a fantastic Friday night special of $78 for two people. Cruise beautiful Muskegon Lake and Lake Michigan while enjoying a delicious buffet dinner of roast beef, smoked salmon and more. A full bar is also available. Make reservations by calling 231-728-8387 or visit portcityprincess.com. The movie, Friday, July 28 is Destination Tokyo. Rocketry Festival 2017 will be held Saturday, July 29 – Friday, August 4 at the Muskegon County Wastewater Management Facility! For more information, visit http://www.nar.org/site/naram-59. Saturday, July 29, join fellow paddlers on the Muskegon Lake for one of three Muskegon Area Community Paddles this summer! If you have a paddle craft, whether it’s a kayak, standup paddle board, canoe or rowboat, you’re invited to the Downtown Shoreline for this free community event. Those without a paddle craft can rent a kayak from Guy’s Ultimate Kayak Service for only $5. Participants must have a U.S. Coast Guard approved personal floatation device. Meet at 8:00am and paddle from 8:30am-10:30am as you commune with fellow kayakers and explore Muskegon’s wonderful waterways. For more information, or to register or rent a kayak, call 231-740-0227. There will be another paddle in the channel on August 19. Brought to you by Guy’s Ultimate Kayak Service, Lake Effect Boat Time and the Muskegon County Convention & Visitors Bureau. Saturday, July 29 at 9:00am, come to Kitchen 242 at the Muskegon Farmers’ Market for “C.O.O.K Competition for Kids with Chef Jack Page!” Creating Original Opportunities for Kids (C.O.O.K.) is a culinary competition for kids! Three teams of kids are paired with local chefs to create dishes using fresh, locally-sourced ingredients along with a mystery ingredient chosen by the judges. Common cooking ingredients will also be available to all teams. Teams will be given tokens to shop in the Muskegon Farmers Market. After shopping, teams return to Kitchen 242 to prepare their masterpieces with the guidance of their chef. Local celebrities will judge the dishes and present the winners with a mystery prize. Participation is limited and cost is $25 to enter. This is for ages 7-13. For more information, call (231) 722-3251. The Norton Shores Library hosts the Lakeshore Camera Club of Muskegon’s Biannual Show and Competition Saturday, July 29 from 10:00am – 6:00pm! Discover local photographic talent, meet the photographers and vote for your favorite to win. There will be refreshments to enjoy and prints to purchase. This event is free and open to the public. For additional information, contact Alison Purgiel, lead librarian, at 231-780-8844 or apurgiel@madl.org. Saturday, July 29 and Sunday, July 30 at 7:05pm at Marsh Field, come watch as the Clippers take on the Loggers. For more information, e-mail info@muskegonclippers.com. Saturday, July 29 at 7:00pm, come to Union Depot for a concert on the lawn with the North Oakland Concert Band performing Summer Pops! The concert is FREE and open to the public. Bring your blanket or lawn chair for an enjoyable evening on the lawn. The Depot will be open with ADA-accessible restrooms for guests’ convenience. For more information, call Visit Muskegon at 231-724-3100 or go to www.visitmuskegon.org. Saturday, July 29 from 7:00pm – 9:30pm, come aboard the Port City Princess for a Luau featuring the Pacific Island Dancers as they perform traditional Hawaiian and Tahitian dances! Tickets are $58 and include an island inspired dinner buffet of teriyaki beef, sweet and sour chicken, fruit medley, mixed salad, dessert and lots more. A full bar is also available on this lovely scenic cruise of Muskegon Lake and Lake Michigan. For more information or reservations, call 231-728-8387. This entry was posted in Calendar of Events on July 25, 2017 by editor. This entry was posted in Fruitport Township on July 25, 2017 by editor. LANSING, MICHIGAN, USA, June 13, 2017 — Michigan lawmakers have the opportunity to improve children’s educational achievements, decrease their use of drugs, and improve their overall health and adjustment without any cost to the taxpayer by passing shared parenting into law. With these benefits to hundreds of thousands of Michigan children in mind, National Parents Organization urges the Judiciary Committee of the Michigan House of Representatives to pass House Bill 4691 when it votes on the bill this Thursday, June 15, at 8:30 a.m. This entry was posted in News Releases on July 24, 2017 by editor. But if you stepped in your best friend’s shoes, the emotion might be really different. Think of the players on the other team, too. Even if they had fun and played their hardest, they may be a little disappointed. Humans feel all kinds of different emotions. They use them to react to different situations, whether that’s playing a game or maybe coming face-to-face with a saber-toothed tiger. For your ancestors, an emotion such as fear could help increase the chance of survival if they did run into this ferocious feline. When people are faced with a potentially dangerous situation, changes in the body happen automatically. A fear signal from the brain makes the heart race, muscles tighten, and the mouth gets dry. The body gets ready to fight or run away. You may express this fear on your face. That’s a signal to people around you that they’ve got to get ready to act. My friend Sara Waters, a psychologist and researcher at Washington State University, is really curious about human emotions. She asks big questions about how and why we develop them and how we share them. When you were a baby, you probably couldn’t express your emotions very well. You had to cry a lot to express yourself and get what you needed. Maybe you threw tantrums. But you soon discovered they didn’t work very well. You may not have had the right words for your emotions yet. When you learned to talk, you started to give your emotions names, Waters explained. The grown-ups in your life probably helped you figure out what those names were. Sad. Happy. Mad. Then, you could start figuring out your feelings on your own and express them to others. Waters’ research actually looks at how some mothers and their babies sort of catch one another’s emotions. When moms look at their babies with a certain emotion, the babies will also show those emotions. They’re kind of like copy cats. Maybe after winning the soccer game your friend gives you a high five. Your friend tells you that it was a little disappointing to lose. Maybe your own team has lost in the past and you remember how it feels. You have a whole range of different emotions you can use to navigate the world, better understand people, and make good decisions. What kinds of things do you do to bring others happiness? How do you show kindness? What makes you happiest? Make a list or tell us about it sometime at Dr.Universe@wsu.edu. This entry was posted in Dr. Universe on July 22, 2017 by editor. ACRE AgTech welcomed Digested Organics LLC as a new client on May 15, 2017. Digested Organics provides the agribusiness sector with sustainable waste management, alternative energy, and water reclamation solutions. ACRE AgTech will use its resources to connect Digested Organics with agricultural and food processing operations that can benefit from their product line. Digested Organics, an Ann Arbor based company, was founded in 2013 with the goal of improving the way society manages organic waste. Simply put, their system can take all different kinds of organic waste—manure, vegetable scraps, beverage waste—and digest it into a fiber component, a nutrient component, and a reusable water component. Initially targeting food waste from grocery stores and food processors as well as solids from municipal wastewater treatment systems, owner Bobby Levine soon saw the tremendous opportunity to help dairy and swine operations manage their manure and nutrients more effectively. With 425,000 dairy cows and 2,000 swine farms in the State of Michigan, Levine began looking for ways to connect with those producers and reached out to ACRE AgTech for assistance. ACRE’s Business Development Manager, Doug Huesdash, got to know Levine, his team, and their products in order to determine how ACRE’s services could benefit their organization. It soon became clear that this would be a mutually beneficial relationship. Levine commented “The ACRE team has been responsive to our needs before and since becoming a client. They helped us secure a Michigan based sales representative almost immediately as well as several new customer contacts. We value the connections and business expertise they have and look forward to continuing to work with ACRE to reach our goals.” ACRE will continue working alongside Levine and his team to help them achieve their business goals while helping producers and food processors solve their waste and nutrient management issues. Digested Organics has successfully installed their technology onsite at Majestic Crossing Dairy, a dairy farm in Wisconsin. As a result of using Digested Organics’ technology on their farm, Majestic Dairy is able to process their 20,000 gallons of manure per day into clean water for farm use and surface water discharge, while at the same time harvesting energy through biogas generation. 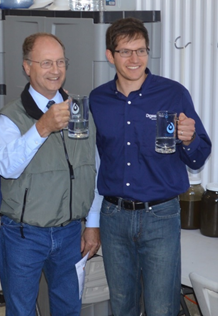 The water that is produced from the manure is so clean that Majestic Dairy has obtained a surface water discharge permit from the DEQ, a permit that has stringent requirements. Digested Organics will be onsite at Michigan State University’s Anaerobic Digestion Research and Education Center through June 23 demonstrating how their technology functions by running test samples from food processors, farmers with manure management issues, and anyone with wastewater challenges. For more information about Digested Organics LLC or if you are interested in providing a sample, please contact Dan Morton, their sales representative, at 616-437-3294 or visit their website at www.digestedorganics.com. ACRE AgTech, formerly the Great Lakes Ag-Tech Business Incubator, has been providing connections and resources to agtech entrepreneurs in Ottawa County and across Michigan since December, 2014. For more information about ACRE AgTech, please visit our website, www.acreagtech.com, or contact us at 616-994-4745 or info@acreagtech.com. This entry was posted in Ottawa County on July 21, 2017 by editor. The most important way to protect against Lyme disease is to prevent tick bites. • Walk in the center of trails. • Create tick-safe zones in your yard. Keep patios and play areas away from vegetation, regularly remove leaves, clear tall grasses and brush around home, place wood chips or gravel between lawns and wooded areas, and use a chemical control agent. • Apply repellent containing DEET (20-30 percent) or Picaridin on exposed skin. • Treat clothing and gear (such as boots, pants, socks and tents) with products containing 0.5% permethrin. Do not use permethrin directly on skin. • Always follow the manufacturer’s instructions when applying any repellents. • Bathe or shower after being outside in tick-infested areas (preferably within two hours). • Conduct a full-body tick check (under arms, in and around ears, inside belly button, behind knees, between legs, around waist and especially in hair). • Examine gear and pets. Ticks can ride into the home on clothing and pets, and then attach to a person later. Use tick prevention products on your pets. • Wash clothing in hot water and dry on high heat after being outside to kill ticks. • Use fine-tipped tweezers to grasp the tick as close to the skin’s surface as possible. Pull upward with steady, even pressure. Don’t twist or jerk the tick; this can cause the mouth parts to break off and remain in the skin. Clean the area with rubbing alcohol, an iodine scrub or soap and water. “Tick checks are recommended after any hike, but especially one along the lake shore,” said John Scholtz, the director of Ottawa County Parks & Recreation. For more tick and Lyme disease information, please visit www.cdc.gov/lyme or www.michigan.gov/lyme. This entry was posted in Health on July 21, 2017 by editor. MUSKEGON, MI – Muskegon’s first public dog park is now under construction as Downtown Muskegon Now has contracted with Port City Construction to complete the Downtown Muskegon PetSafe Bark Park. 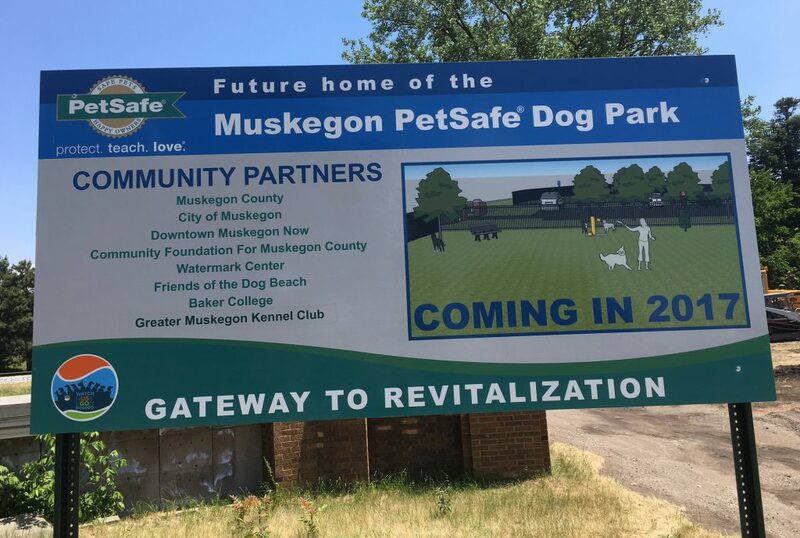 The off-leash dog park at the corner of West Western Avenue and Shoreline Drive is a collaboration of funding groups led by the Michigan Economic Development Corp., PetSafe, the Greater Muskegon Kennel Club, Community Foundation for Muskegon County and Downtown Muskegon Now. Muskegon County and the city of Muskegon are key partners in the project along with dog enthusiasts throughout the community. About $110,000 was raised by the community through a crowdfunding campaign last year established by the MEDC with a $50,000 placemaking grant to improve the quality of life of downtown residents and visitors – along with their pooches. DMN worked with a dog park advisory group, Muskegon landscape architect Harry Wierenga and project architect Andrea J. Riegler of Muskegon to design the park with small- and large-dog fenced areas, parking and an irrigated turf. DMN signed a construction contract with Port City Construction after receiving three bids, all significantly over the construction budget. Port City Construction and its subcontractors have begun the dog park construction on the 0.7-acre site and will have the facility completed in the next four months. DMN hopes to have a grand opening sometime in late summer or early fall. Besides the dog park, downtown visitors this summer will find ongoing construction with the Muskegon Community College Downtown Center, Berkshire Senior Housing Center, HighPoint Flats apartments, Heritage Square Commons, Terrace Plaza apartments and Terrace Pont Landing waterfront homes. This entry was posted in News Releases on July 19, 2017 by editor. President Roger Vanderstelt called the meeting to order at 7:00pm. May 23 meeting minutes, Motion made by Amy Haack, supported by Donna Pope. With a unanimous vote the motion carried. June 6 public hearing minutes, Motion made by Amy Haack, supported by Donna Pope. With a unanimous vote the motion carried. 6. Approve the agenda for June 27 Council Meeting: Motion made Donna Pope, supported by Amy Haack. With a unanimous vote the motion carried. 7. Appointment of New Council Member to vacant seat. Motion made by Roger Vanderstelt, supported by Amy Haack to appoint William Overkamp as a member of the Council with his term expiring in 2018. With a unanimous vote the motion carried. William Overkamp was sworn in. 8. Council reappointment of Planning Commission Personnel. Roger Vanderstelt made a motion to appoint Jeff Jacobs, Mike Michelli and Dever Bendixsen to the Planning Commission for a term of 3 years as stated in the bylaws of the Planning Commission to expire on June 2020. He also clarified that we have appointed Carl Russell as the liaison to the Planning Commission with his term expiring in November 2020, supported by Haack. Discussion took place. Carl Russell questioned if there should be five members on the committee. He questioned if Jeremy could be on the Planning Commission and the Zoning Board of Appeals or would that be a conflict of interest. Carl Russell suggested contacting our attorney. Will Overkamp stated a concern of everyone’s term expiring at the same time. With a unanimous vote the motion carried. Additional discussion will be tabled until the July council meeting. 10. Candace Croswell Craft Show and Dog Nail Filing in the Park. Candace Croswell, Anne Marie Barn Boutique requested a temporary suspension of no dogs allowed in the park on August 12, 2017 for her event. She has a pet groomer willing to do free nail trimming for dogs. A pet station will be donated for the day. Motion made by Haack to allow the request and let the groomer come in on August 12, 2017, supported by Pope. With a unanimous vote the motion carried. A brief discussion took place about allowing dogs in the park. Amy stated that this was an item for the Friends of the Park Group. Donna gave an update that the library is doing great. Amy distributed the Parks and Recreation meeting notes. The next meeting is July 10, 2017. Carl Rothenberger – Nothing to report. Carl Russell – Nothing to report. Bill Stone – Commented on the great job Bethany is doing at the library. Will Overkamp – Nothing to report. 12. Correspondence – Ann advised that we recently completed the off year audit with our accountant. The garbage bills have been sent out and the delinquent garbage bills have been submitted to Rose Dillon to add to tax bills. 13. Update on Boat Launch Docks, Traffic study on 3rd and Pontaluna. Jeremy Statler, DPW Supervisor stated we are still on schedule for August completion. Feel free to call him if you have any questions. Jeremy also discussed the Traffic study on 3rd and Pontaluna. The results very mimicking of the other study results, the speed limits are too low. Carl Rothenberger asked about signs for the other street. Jeremy said they are on hold so all could be done at the same time. Donna asked about the welcome to the village signs on Brooks Ave. Jeremy said they will all be done together possibly in the fall. Grind them out and it may scar the road. Black paint over the top of the lines. Leave alone and let them fade away and don’t repaint next time. Mr. Surridge spoke about his concerns over the lines. Motion made by Amy Haack, supported by Donna Pope to let the lines fade away and to reevaluate at a later date. With a unanimous vote the motion carried. A quote from US Golf Cart was in the board packet. Carl Russell questioned the ordinance and made a motion to send to the Planning Commission, supported by Bill Stone. Discussion took place, Bill Stone suggested looking into a UTV (Utility Terrain vehicle) as an alternative. Carl Russell asked if Jeremy could email how they would be using it. Jeremy stated going back and forth to the park. Carl Rothenberger thinks we can take time to research while figuring it out. With a unanimous vote the motion carried. Jeremy reviewed a letter from the Village’s engineer regarding costs for a fishing pier at the end of 8th Ave. Discussion took place about parking and that it is technically the end of a road, Carl Russell suggested a possible guard rail or signs to stay off the rocks. Medical Marihuana Facilities within the Village of Fruitport and to request our attorney to draft a formal resolution to that effect, support by Bill Stone. Discussion took place. Carl Russell feels that responses were based on feelings not data, he doesn’t see the harm in it and see the benefits, and he also welcomes the business. Carl Rothenberger stated it was about the location within the Village. Bill Stone supports the people. Roll call Carl Rothenberger – AYE, Bill Stone – AYE, Donna Pope – AYE, Will Overkamp – AYE, Amy Haack – AYE, Carl Russell – NAY and Roger Vanderstelt – AYE. With a majority vote the motion carried. Jeremy reviewed the proposed Park Lighting diagram and quote. Bill Stone asked if this was the only quote we got. Jeremy discussed why he went with only one quote. A discussion took place about funding. Item to be tabled until the July meeting. 19. Boat Launch attendant – Roger stated that Margo Hawkins has been the boat launch attendant for the last 3-4 years. She monitors the launch over the 4th of July weekend, Coast Guard and Labor Day. Roger made a motion to increase Margo’s wage from $10 per hour to $12 per hour, supported by Carl Rothenberger. With a unanimous vote the motion carried. Discussion took place about having a credit card reader at the boat launch. The item is tabled until the July meeting. Bethany Nettleton commented on the golf cart and gator. Questioned if you technically need an ordinance. Bethany also commented on the MMMLA and that the Planning Commission representative said there was not enough room in the Village. Jason Kolkema was going to ask if we could table the request for Medical Marihuana Facilities until all of the information comes out. He understand nobody wants that stuff, they are concerned about property rights and zoning as well. People can change. Talked about opinion vs. data. Jason discussed crime in relations to the current caregiver law that is in place. Roger stated the Council has made their decision. Bill Surridge – Thinks the fishing pier is a great idea. Carl Rothenberger said we have looked into the safety down there and the goal is to make it safe. 23. WARRANTS- Carl Russell questioned the Asphalt Paving bill and if it was voted on. Russell questioned the policy for approving the bill. Several council members stated it was discussed in the budget meeting and was approved in the 2016-2017 fiscal year budget. Motion made by Carl Rothenberger to approve Warrants, supported by Amy Haack. With a majority vote the motion carried. 24. ADJOURN – Motion by Donna Pope to adjourn, supported by Carl Rothenberger. With a majority vote the motion carried. 9:02 pm. This entry was posted in Fruitport Village on July 18, 2017 by editor. Thank you to all my new friends or your help. I am blessed. This entry was posted in Letters to the Editor on July 18, 2017 by editor. Throughout the summer, every Tuesday evening at 7:00pm at the Montague Band Shell, join the Arts Council of White Lake (ACWL) for the Free Summer Concert Series! In case of inclement weather, concerts will be held at the Montague Area Public Schools Center for the Arts located at Montague High School. For more information, call 231-893-2524. July 20-23, the Egelston/Wolf Lake Festival is happening in Flickema Park, featuring a 5K run, movie night, outhouse races, arts and crafts fair, food vendors, children’s activities, music and a parade! For more information call Alex at 231-788-2308. Free Movie Night – (Dusk) Come to Beals Park for night of movies and popcorn. The film will be “Kicking and Screaming” (PG) starring Will Ferrell. Festival Parade – (6:00pm) Parade begins on Park St. at Oakridge Lower Elementary. Outhouse Races – Immediately following the parade on Park St.
Day of Worship – (10:00am) Led by Pastor Dan Smith of Jipson Immanuel Baptist Church, Beals Park. Thursday, July 20 at 7:05pm at Marsh Field, come watch as the Clippers take on the Loggers. For more information, e-mail info@muskegonclippers.com. The 2017 Summer Theatre Festival at Howmet Playhouse happens every Thursday, Friday and Saturday from July 6 through August 19! All Shows Begin at 7:30 pm (Unless otherwise noted). Become a Member now for the best value. Make a single purchase, then pick and choose the plays you wish to attend. You will have the opportunity to select your desired membership level as part of the purchase process. Single Show Tickets are $21 for adults and $17 for students. Theater Box Office Hours are weekdays from 1:00 – 5:00pm from July 5 through August 18 and one hour before curtain. Auditions will be announced soon! For more information, visit the website below or call (231) 894-4048. Friday, July 21 from 3:30pm – 7:00pm, and Saturday, July 22 from 10:00am – 2:00pm, come to the Norton Shores Library for the Muskegon County Garden Club Flower Show “Books in Bloom, Cookbook Collection!” This is a standard flower show featuring horticulture, designs, youth exhibits, artistic crafts and educational exhibits. This event is free and open to the public. For more information, call 231-755-4409. July 21 at 9:30am, come to the White River Light Station for Yoga at the Light! Bring your yoga mats or large towels and water to drink and join SPLKA for Yoga. The rain date is July 28. For further information call Mitch Coleman at White River Yoga at 231-740-6662. For more than 30 year’s Parties in the Park has been a Muskegon institution providing Friday evening entertainment, free admission and a family-friendly atmosphere! Be a part of the tradition and enjoy a summer evening with us downtown in Hackley Park. There are always five local Muskegon food vendors at every party, there’s something for everyone to purchase. July 21, the band is Whoopee Kat, hosted by the Muskegon Optimists Club. Happy hour is from 5:00pm-6:00pm with the night ending at 9:00pm. For more information e-mail info@partiesinthepark.com. July 21 from 5:30pm-9:30pm, come to downtown Ravenna for the Ravenna Dog Daze & Car Cruise-In! There’ll be free dash plaques and goody bags for the first 125 entries. There’ll also be childrens games, food, the beverage tent, live entertainment, the craft show and raffles. All proceeds support local charities. For more information call 231-557-6572. The movie, Friday, July 21 is Remember the Titans (PG). July 22 at 2:00pm, come to the White River Light Station for live music from the Western Michigan Dulcimer Friends! Come enjoy a Saturday afternoon with a group of acoustic musicians that between them have decades of experience playing folk music, the music of our ancestors handed down through time. This is the music played in grange halls for square dances. The musicians will be playing dulcimers, guitars and fiddles to mention a few. They play for the love of music. Bring your family, your blankets or lawn chairs and enjoy an afternoon of folk inspired music while visiting and exploring the White River Light Station. The museum and tower will be open for the standard admission charge. For more information, call (231) 894-8265. The Michigan Lighthouse Conservancy is offering sunset tours of the Muskegon South Pierhead Light Saturdays in July from 5:00-8:00pm. The cost is $2 – $4. For more information, call 844-MLIGHTS or visit www.muskegonlights.org. Join Maranatha every Saturday at 7:00pm for their summer concert series! All concerts are free and open to the public and feature artists like Meredith Andrews, Selah and Ellie Holcomb. For more information visit vacationwithpurpose.org or call (231) 798-2161. Saturday night, July 22, come to beautiful Pere Marquette Beach for “Movies on the Beach!” The movie will start around dusk at Pere Marquette Park (plan to be there by 9:30pm). This month’s movie is “Pirates of the Caribbean” (PG) starring Johnny Depp. This event is free and open to the public. Come on down early to climb to the top of the South Pierhead Lighthouse from 5:00-8:00pm for a small fee. Donations will be accepted (and are welcomed) in order to cover costs and raise funding for future movie nights. Bring a chair and picnic basket and enjoy! July 23 at 11:00am, Muskegon Yoga and The Deck are teaming up to bring together two well-loved past times: yoga and beer drinking. Only $10 will get you a 1 hour Vinyasa yoga class (all levels welcome) and a beer at beautiful Pere Marquette Beach. Bring your yoga mat and a friend, enjoy a yoga class, then refresh with a beer. There are limited spots available so register early! For more information, call 231-668-4181. July 24-29, experience the wonders of farm life in West Michigan at the Muskegon County Youth Fair! Support the local youth while they proudly display their agricultural works of the year and show their prized animals at the Muskegon County Fairgrounds! For more information, visit www.muskegonfairgrounds.com. This entry was posted in Calendar of Events on July 17, 2017 by editor. Monday, July 17, 2017 – 7:00 p.m. This entry was posted in Fruitport Schools on July 17, 2017 by editor. Photos of Muskegon Win Prizes! Muskegon, MI – During the month of July, Watch Muskegon is hosting a photo contest on social media. 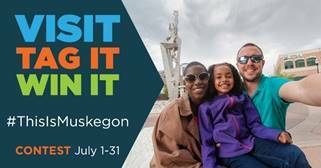 The public is encouraged to visit Muskegon County, take a picture that captures their experience and share it to Facebook or Instagram using the hashtag #ThisIsMuskegon. A panel of judges will select a winning photo in August with a grand prize of $1,000 cash and other Muskegon-focused items including stays at various hotels, passes to museums and festivals, and gift cards for local restaurants. A full description of the grand prize package, along with all the contest details, is available on the Watch Muskegon website. Muskegon is the ideal location for the lakeshore lifestyle with award winning beaches, state parks, festivals, restaurants, and other attractions. 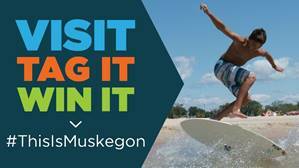 Find your favorite Muskegon County attraction, tag your photo #ThisIsMuskegon and you are automatically entered into the contest. The contest is part of the Watch Muskegon campaign, which was created to promote the Muskegon area with a focus on economic development, beautification and education. The campaign is currently in year 3, with plans to extend until 2020. To learn more about the contest and the Watch Muskegon campaign, visit www.watchmuskegon.com. This entry was posted in Muskegon Lakeshore Chamber of Commerce on July 16, 2017 by editor. 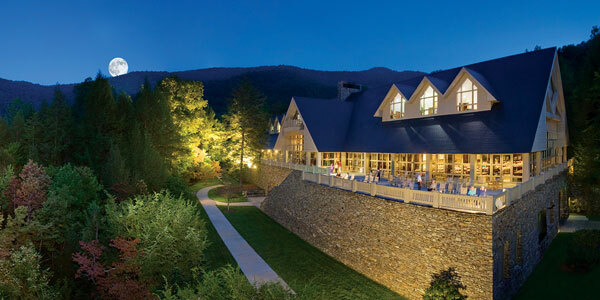 Summer programming at the Billy Graham Training Center at The Cove includes events that will encourage participants to be strong in their faith and find power in God during tumultuous times. For more information about these, and other, events, view the complete events schedule online at www.thecove.org. This entry was posted in Billy Graham on July 16, 2017 by editor. Planned Parenthood recently released their 2015-2016 annual report. Their own numbers show their increasing focus on abortion is coming at the cost of both health services and U.S. taxpayers. They also show how Planned Parenthood manipulates their own data to create talking points to distract from their abortion mission. Planned Parenthood’s tax-funding has increased dramatically in the last 10 years, up 82 percent. Abortions have increased 24 percent. Despite receiving much more tax funding, their overall client base declined 23 percent, their contraceptive clients decreased 20 percent, and their breast exams decreased 62 percent. Planned Parenthood knows most Americans don’t support tax-funded abortions, so they frequently employ their talking point that “only 3 percent of our services are abortion.” The point itself is misleading. Looking at their recent annual report, they reported serving 2.4 million clients and did 328,348 abortions. That’s 14 percent. Thankfully some media outlets have pointed out the deception. Few have reported that Planned Parenthood doesn’t just conveniently use the “3 percent” statistic; they purposefully manufacture it by massaging the client data in their annual report. If you look at their annual reports over the years, you’ll see that new categories of services get added to the report out of thin air. These “new” services never get touted as actual new services they offer. Consider their most recent annual report as an example. Many of their largest services saw cuts. They had 100,000 fewer clients. They provided 72,947 fewer women with contraception. Their manual breast exams dropped by 42,103. Several other services experienced declines. Did anything increase? They provided 25,553 more STI tests and 22,260 more pap tests. Those small increases don’t make up the difference between their decreasing services and increasing abortions to keep their “3 percent” statistic alive. They are forced to use some clever accounting. In their latest report we suddenly see Planned Parenthood provided 226,254 well women exams; they already count them as breast exams and pap tests separately. They invented the category of “Other Contraceptive Services,” providing 100,673 services. Also new are “Other STI Prevention and Treatments,” totaling 26,042 services. When Planned Parenthood adds it all up they get 9,494,977 services and 328,348 abortions, just enough to keep abortion at 3.46 percent of their “services”—how convenient. Even Planned Parenthood’s clever accounting can’t distract from the reality that they use taxpayer dollars to expand their abortion infrastructure at the cost of patients and health services. This entry was posted in Right To Life on July 16, 2017 by editor. The Spirit Ride is Coming Through! The very professionals who earn a living from highway accidents are now taking to the streets to promote highway safety and help safeguard the lives of fellow first responders. The Spirit Ride will relay a ceremonial casket by car carrier across the nation and back. About 300 towing companies across the U.S. are contributing their services to the Spirit Ride to promote safe driving and the Slow Down, Move Over law. The Ride will pass through Muskegon, MI with the Spirit casket being relayed to 1st Class Towing. A ceremony will take place at 2:30 pm, 240 Seminole Rd., Norton Shores, MI 49441, followed by a procession of tow trucks and emergency service vehicles through Seaway Dr. toward downtown and back onto US31 SB. The Move Over law is often ignored and seemingly unknown to many motorists. The law exists in all states of the Union and requires passing vehicles to move over one lane when approaching an incident where tow operators, police, fire fighters and EMS people are working. The ceremonial casket, named Spirit was custom built by a carpenter who is also a lifelong singer-songwriter (Mike Corbin) who composed the Spirit Ride’s anthem. The casket was custom painted by an artist (Cecil Burrowes) who specializes in painting trucks and wreckers. The colorful ceremonial casket, called Spirit, is at eight feet, a stretch farther than a standard casket. Painted on it are a dozen scenarios depicting first-responders at the scenes of highways incidents. While promoting public awareness of the Move Over laws the Ride at the same time honors first responders who’ve been killed by passing vehicles. Hundreds of roadside professionals are casualties each year of roadside incidents; about 100 of them are killed. Among police, fire, EMS and towing professionals, 60% of those killed are tow operators. Some 300 tow companies are relaying the ceremonial casket by car carrier from town to town across the nation and back. According to American Towman Magazine President Steve Calitri, the Ride is the greatest project in the history of the towing industry, which celebrated its centennial in 2016. The Spirit Ride was founded by American Towman Magazine and B/A Products and is a project of American Towman Spirit, Inc., a nonprofit corporation, born to promote highway safety. Tow industry sponsors have pitched in with funds to support the coordination of the Ride and its media outreach campaign. All the towing companies participating by relaying the casket are contributing their services. This entry was posted in News Releases on July 15, 2017 by editor. Quarter zip tech shirts for all runners. Bling for all M23.1k Run finishers. The run will begin and end at the scenic Connor Bayou County Park, 12945 North Cedar Dr, Grand Haven. The park will be the location for the start line, finish line, and post-race party. This entry was posted in Ottawa County on July 15, 2017 by editor. Ottawa and Allegan County…lace up your walking shoes and get ready for a free 6-week walking challenge. Registration opens on Friday! Ottawa and Allegan Parks and Recreation and Department of Public Health are teaming up to bring the community another Step it Up! Walking Challenge this fall. 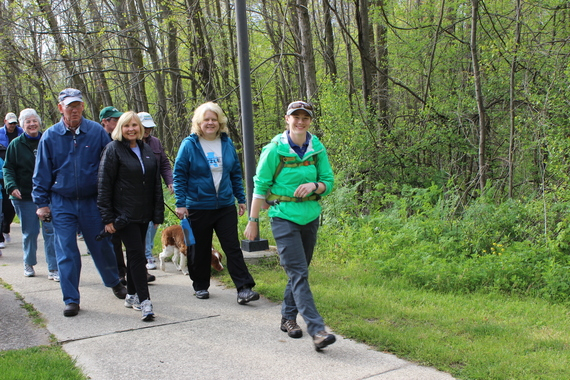 Parks Naturalist, Kelly Morrissey, leads a walking group at Paw Paw County Park in Holland. Last spring, over 800 participants walked 106,609.6 miles – four times around the world! This fall, participants will “virtually walk” 210 miles along regional trails in Michigan. The challenge begins on Monday, August 14 and registration opens on Friday, July 14! This free 6-week program is designed to encourage participants to stay active as summer comes to a close. Participants of all fitness levels are invited to join – weekly prizes are available. Optional group walks will be offered for those interested in getting their weekly steps in with a group while checking out Ottawa and Allegan County Parks (schedule below). Each walk will be led by a naturalist guide. Different pace groups will be available. • Great program to encourage people to exercise and use the county park system. • I loved this program! It motivated me to get walking again! I moved back to Holland two years ago and I learned a lot about the parks in Ottawa County through this program! I will be buying a pass and keep visiting our parks! Thank you very much! • It has helped us lose weight and feel so much better. • Prior to this challenge my daily steps were closer to 5,000 and since doing program I’m between 7,000-10,000 and some days way more. It challenged me to park further away and keep pedometer with me when walking around my house for a true count of my steps. Thanks for the motivation. Registration opens this Friday, July 14! July 7, 2017, Muskegon, Michigan – The Muskegon Museum of Art presents “The Little River Band of Ottawa Indians: Our Story,” a lecture by tribe Ogema Larry Romanelli, on Thursday, July 13. The event will start with a reception at 5:30 pm. The lecture begins at 7:00 pm in the MMA’s auditorium. The reception and program are free and open to the public. Mr. Romanelli will discuss the history and current life of the Little River Band of Ottawa Indians. He is a lifelong Muskegon resident and is from the Thunder clan of Odawa Indians. In 2007, he was elected as the Ogema, Chairman, and Chief of the Little River Band of Ottawa Indians in Manistee, MI. Mr. Romanelli was re-elected to a second term of office in 2011 and to a third term in 2015. He is also a successful businessman and owner of three businesses in West Michigan. Levi Rickert, editor of Native News Online, a national publication of, by, and for the indigenous peoples of North America, will talk about his recent experiences at the protests at Standing Rock in North Dakota. Free Family Fun Day. Explore Native stories with special activities. Free admission and activities. Screening of Coming to Light, Edward S. Curtis and The North America Indians, followed by Q & A with Anne Makepeace, the film’s writer, director, and producer. Coming to Light was an Academy Award finalist for best feature documentary in 2001. The North American Indian is an exhibition of national significance that explores the depth, breadth, and lasting cultural legacy of Edward Curtis’s monumental work. The exhibition, both survey and critique, tells the story of one of the most prominent photographers of his time, who sacrificed everything for his work on The North American Indian, only to die in obscurity. Curtis’s images have been extensively exhibited and collected, and have become iconic over the past century. Organized by the MMA, this exhibition will be perhaps the largest and most comprehensive survey ever presented of The North American Indian. For what may be the first time, the entire collection of all 723 portfolio photographs will be on display. Importantly, this thorough survey and overview of The North American Indian also examines the challenges and controversies that the work has faced through the years, and in our own time. The exhibition runs through September 10, 2017. Visit muskegonartmuseum.org for visitor information or call (231) 720-2571. Michigan’s Heritage Park, through October 28 and Lakeshore Museum Center, May 11 through September 10 The Lakeshore Museum Center is featuring over 40 Native American artifacts from its collection at Michigan’s Heritage Park in Whitehall and in the Cabinets of Curiosity at the main museum site in downtown Muskegon during the MMA’s exhibition Edward S. Curtis: The North American Indian. Among the artifacts on display in the Visitor Center at the park are two headdresses, jewelry, pottery, beadwork, baskets, and moccasins. The items selected for the display complement a selection of Curtis’s photogravures. The items in the Curiosity Corner are primarily beadwork and jewelry. For more information, visit www.lakeshoremuseum.org or call 231.894.0342. For more information, visit www.lakeshoremuseum.org or call 231.894.0342. Thursday, July 27, 7:30 pm, Friday, July 28, 3:00 pm, Saturday, July 29, 7:30 pm The true story of a young Squaxin Indian girl, who is forcibly taken from her home and placed in a government-run school in 1911. Jessica Diemer-Eaton will demonstrate traditional Native American food preparation. For more information, visit www.lakeshoremuseum.org or call 231.894.0342. This entry was posted in Calendar of Events on July 15, 2017 by editor. Join us for a historic tour in the Frauenthal Theater including the Mighty Barton Organ! The Women’s of Purpose Auxiliary with its sponsors …. Church of God Holy Faith, Community Shores Bank, Meijer, Muskegon FCU, and Muskegon Family Care present.. the Lakeshore Women’s Expo on Saturday, August 26, 2017, from 11 a.m. to 4 p.m. at the Lakes Mall, Muskegon, Mi. All are welcome to attend this free event, including men and children. Vendors will be present, some conducting free screenings, testing and examines on a broad range of services/topics. Enter once for free drawings that will run randomly throughout the event (over 100 gifts to be given away. Details discussed at the event). Join us for live stage events and presentations that will run from 12 noon to 4 p.m. Presentations include: Managing pain w/o the use of prescription drugs by speaker, Ramona Wallace, DO; Belly Dance Fitness Demonstration put on by the Lakeshore Fitness Center, Self Defense Demonstrations useful in warding off assault by Salomon Karate Studio; A Fall Fashion Show featuring models and attire from Lakes Mall vendors; CPR & Heimlich Maneuver Demonstrations by the American Red Cross, Zumba Demonstrations by Instructor Glenda Meier; and Songs of Worship by the Praise Team of the Church of God Holy Faith, with its pastor, Bishop M. L. Bankhead. This is the 2nd photography exhibit of the Boys and Girls Club of Muskegon at the Frauenthal. These creative 6-18 year olds were guided by their mentor Hillary Jones who says, “This year’s theme is inspired by Muskegon’s rich scenery and architectural gems in our fair city. As you explore the exhibit, you will find yourself strolling through downtown Muskegon. You will follow the journey of our young photographers as they captured the royal blues of Muskegon Lake and the splendor of Hackley Library. “We are very excited about the two different perspectives of the Michigan landscape,” said Ricki Levine, Frauenthal Center Managing Director. “The colors and textures of Kristen’s vibrant paintings contrast the photos by the Boys and Girls Club. It seemed like a wonderful divergence to display together”. Open through August 6th, admission to the exhibition is free. Guests may tour the reception gallery on weekdays from 9 a.m.-5:30 p.m.,with extended hours on show nights. Exhibits are open to the public (with the exception of during private events) and admission is always free. Muskegon, MI: Nonprofit charitable organizations serving the Muskegon County region are eligible to apply for a grant from the Community Foundation for Muskegon County (CFFMC). The Foundation gives grants to 501(c)(3) organizations, churches, schools, agencies and governmental units serving the greater Muskegon County area. The grant deadline is September 14; however, an Application of Intent Form should be submitted by August 31. All applications must be submitted online at www.cffmc.org/grants. Grant recipients will be announced by November 15. The Foundation will consider proposals in the following areas: arts and culture, health and human services, education, environment, emerging community needs, and community needs/urban revitalization. Proposals should also be built around at least one of the Foundation’s new leadership goals: promoting collaboration and efficient use of community resources; creating hope and opportunity for our youth; and making Muskegon County a more inclusive and accessible community. 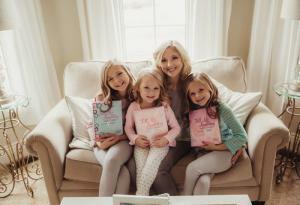 • The Julia Hackley Memorial Fund of the Foundation will consider applications that support the needs of City of Muskegon residents, with priority given to meeting the needs of low-income individuals and families. • The Greater Muskegon Women and Children’s Fund will consider applications that focus on meeting the needs of Women and Children in Muskegon County. • The Youth Advisory Council (YAC) of the Foundation will consider applications that address projects and programs that focus on serving Muskegon County youth. • The Environmental Fund will consider applications that build community capacity, educate, provide environmentally-oriented technical assistance, protect and preserve natural resources and clearly relate to the environmental interests and needs of the Muskegon region. • The Muskegon County Medical Society Fund will accept applications that focus on programs and projects relating to health and science education and related activities. • The White Lake Community Fund will accept applications for projects in the White Lake area that address the following community needs: social services, environment, civic affairs, education, and youth. All applications, made online through eGrant, are general applications that are matched by staff with the best-fitting fund. Complete details about the Foundation’s funding priorities and applying for a grant can be found at www.cffmc.org/grants. Questions? Contact JacQuaye Payne, Program Officer, at jpayne@cffmc.org, or 231.332.4124. Floating is one way animals get to islands. They may float on their own or they may take a kind of raft. This raft is often made up of plants, branches, or other things that blow out into the sea during a storm and are swept together in the ocean. Flying helps animals like bats and bugs get to islands. Piovia-Scott reminded me that some animals fly for just a small part of their lives, too. Before some ants are fully grown, they go through a stage where they have wings. An ant might find it hard to swim in the ocean. But while it has wings, it can make a flight to a new place. If animals are light enough, they may get picked up in the wind and sort of drift along. For example, spiders use their silk to catch the wind and move to new locations. Also, a lot of plants get to islands because of the wind. Plant seeds often catch a ride in the air. When they reach the island, they get buried in soil and start to sprout. These plants provide food for many animals. Finally, there are animals that are just good swimmers, such as seals. They can paddle long distances to an island and some also find a home on the land. Piovia-Scott explained that animals often take advantage of their new island life. We see these changes in animals such as the marine iguana. Most iguanas we know about only live on the land. But iguanas on the Galapagos Islands dive into water to look for food. They have developed ways to use the resources in and around their island environment. Another place we see this is in the Pacific Northwest on the San Juan Islands. On these islands, we find raccoons that eat shellfish. Piovia-Scott said you could probably say the same is true of people who live on islands—they tend to eat a lot of fish. That sounds like my kind of place. I might have to go and explore an island one of these days. In the meantime, I’m going to see if I can make a flying device and floatation device to learn more about how things travel on water and in the air. You can try it out, too. Find this article and the instructions at askDrUniverse.wsu.edu. This entry was posted in Dr. Universe on July 15, 2017 by editor. The Muskegon Lakeshore Chamber of Commerce is the premier business membership organization on the lakeshore representing approximately 1,200 businesses and organizations. The Muskegon Chamber represents businesses of every size and type all over West Michigan. The Chamber is celebrating more than 120 years in operation working to sustain an environment for business success through community leadership, promotion, inclusive business advocacy and valued member services. The Muskegon Chamber is a four-time award winning Chamber, being named Chamber of the Year for the State of Michigan in 2006, 2010, 2012 and 2015 by the Michigan Association of Chamber Professionals. This entry was posted in Muskegon Lakeshore Chamber of Commerce on July 11, 2017 by editor. The Ministry of Magic is pleased to announce that 16 lucky young Muggles will be accepted to the Hogwarts School of Witchcraft and Wizardry this summer! Wizards and witches will receive training in Potions, History of Magic, Charms, Care of Magical Creatures, and Defense Against the Dark Arts. All students will be required to sit for their O.W.L.s (Ordinary Wizarding Levels) at the end of the week- NO EXCEPTIONS. Please note: It is important that all students have read at least the first book in the Harry Potter series, Harry Potter and the Sorcerer’s Stone, to fully experience this camp. $125 includes instruction, field trips, craft materials, plus morning & afternoon healthy snacks. Bring your own lunch or $5 to purchase lunch (including beverage). For more information or to register, call 231-894-5333.
filled with earthy, organic soundscapes that impart a mood of peace and tranquility. Hiroya Tsukamoto is a guitarist and composer originally from Kyoto, Japan. In 2000, he received a scholarship to Berklee College of Music and came to the US. Since then, he has been performing internationally including several appearances with his group at Blue Note in New York and released six albums as a leader. And he also performed and appeared on major televisions internationally such as NHK (Japanese National Television) and EBS in Korea. For more information, call 231-722-8000. Tuesday, July 11 at 6:30pm, come to Kitchen 242 inside the Muskegon Farmers’ Market for “Healthier You: Gluten Free Cooking with Chef Jamie (Part 1)!” Gluten intolerant? Just want to eat healthier? In this class you will prepare an appetizer, entree and dessert, all gluten free! This is a two-part series and the second class will be held on Tuesday, July 25. The cost is $35. This is a hands-on class, so bring your appetite and there will probably be leftovers to take home. Gluten free eating is easier than you think. For those who register for both classes, a $5 token will be provided for shopping at the Muskegon Farmers Market. For more information, call (231) 722-3251. Muskegon’s ‘Rebel Road’ is a family friendly event that emulates the years of success that Bike Time had with “Steel Horse Alley” on Western Ave. with motorcycle parking, beer tents, stunt groups and pyrotechnic shows. The event is happening July 13-16 and coincides with Muskegon Bike Time. Rebel Road is also adding Rebel Road Family Night from 6:00pm – 10:00pm on July 12 with pony rides, a mechanical bull, live entertainment and beverages! They’ve got an awesome lineup for everyone this year. Admission is always free in the Beverage Tents, so come on in and enjoy the shows. All proceeds benefit the Child Abuse Council of Muskegon County. Check them out on Facebook or www.rebelroad.org for details. ​LC Walker Arena Lot 477 W. Western Ave.
Wednesday, July 12 and Thursday, July 13 at 7:05pm at Marsh Field, come watch as the Clippers take on the Leprechauns. For more information, e-mail info@muskegonclippers.com. Muskegon Bike Time is back again for 2017 and begins a new decade of promoting Muskegon as a tourist destination, by celebrating all things related to motorcycle enthusiasts. The event this year will be held July 13 – 16. Muskegon Bike Time is welcoming two large traveling displays from the Harley-Davidson Corporate Headquarters to Bike Time at Hot Rod Harley Davidson in downtown Muskegon. In addition to promoting and marketing the third weekend in July as an event for motorcycle enthusiasts, Muskegon Bike Time will focus its attention on providing activities geared especially for the motorcyclist. The focal point of Bike Time activities will be at the Hot Rod Harley Davidson property in downtown Muskegon. Hot Rod Harley Davidson, located at 129 Shoreline Drive, will be open from 9:00am until 8:00pm each night of Bike Time. Hot Rod Harley provides new and used motorcycles, excellent service, parts, accessories and apparel. • Patriot Ride – scenic ride that raises funds to support Every Woman’s Place shelter. • 7 Lakes Northern Ride – scenic ride showcasing 7 different lakes and many interesting small towns in West Michigan. • Hot Rod Harley & Downtown – leaving Hot Rod Harley Davidson in downtown Muskegon, cruise the strip of Western Avenue, which is open to motorcycle traffic only, which includes beer tents, brewery’s, restaurants, vendors and other activities. • Pere Marquette Beach – visit one of the most beautiful sugar sand beaches in the country right on Lake Michigan. • Lake Shore Drive Southern Ride – this ride takes you along the Lakeshore to resort town of Grand Haven and the Dutch village of Holland and several lakes and rivers. • Muskegon Bike Time is encouraging others to plan and develop events and activities for the enjoyment of visitors to the Muskegon area. Please notify Muskegon Bike Time of your activities so they can be promoted in advance to those intending to visit the area. For more information on Muskegon Bike Time 2017, please visit their website at www.muskegonbiketime.com or follow them on Facebook or Twitter. Mr. Romanelli will discuss the history and current life of the Little River Band of Ottawa Indians. He is a lifelong Muskegon resident and is from the Thunder clan of Odawa Indians. In 2007, he was elected as the Tribal Ogema, Chairman, and Chief of the Little River Band of Ottawa Indians in Manistee Michigan. Mr. Romanelli was re-elected to a second term of office in 2011 and an unprecedented third term of office in 2015 which he will serve out until the year 2019. Along with his tribal work, he is a successful businessman and owner of three businesses in West Michigan. The event begins at 5:30 with a reception and refreshments. The lecture begins at 7:00pm. For more information, call 231-720-2570. Thursday, July 13 at 6:00pm, come to Kitchen 242 inside the Muskegon Farmers’ Market for “Cooking with Fresh, Local Herbs with Chef Char!” Curious about what herbs enhance flavor best for particular foods? Do you grow your own herbs and want new ideas for using them? Are you curious about what herbs and ingredients make the best compound butter for cooking? Class participants will try pesto, compound butter, oils for dipping and a chicken dish made with class creations. Class size is limited to 15. The cost is $35. For more information, call (231) 722-3251. Call (231) 894-4048 for more information. July 14 at 7:00pm, come to the White River Light Station for live music with Wyatt and Shari Knapp! Known for their sparkling vocals, lush harmonies, and tasteful blend that sets them apart, this personable and engaging husband-wife duo has warmed the hearts of audiences throughout Michigan and beyond. While remaining true to their traditional and Americana roots, their music reaches into genres as rich and diverse as bluesy folk, “high lonesome” bluegrass, and timeless classics of the 1940’s. Shari’s rhythm guitar provides a pleasing foundation for Wyatt’s finger-style and flat-picking guitar leads, as the two serve up fresh arrangements of obscure covers, time-tested favorites and original tunes for audiences of all ages. For more information, call (231) 894-8265. The movie, Friday, July 14 is Enchanted (PG). Every Friday from 10:00pm – Midnight, after you “Party In The Park” come to the Port City Princess to “Dance by the Dock!” Each dance features a musical theme such as The 80’s, Classic Rock, Endless Summer, Swing, Modern Pop and other great genres to get you in the groove. There’ll be a full bar, so you’ll need to be 21 or over to attend. This is not a cruise, but a big party on the boat, and admission is absolutely FREE! For more information, call (231) 728-8387. Saturday and Sunday, July 15 and 16 from 10:00am-4:00pm, come to Michigan’s Heritage Park at Hilt’s Landing for the Native Heritage Pow Wow! A traditional outdoor Pow-Wow offers park visitors the opportunities to see traditional dancers, fancy shawl dancers, jingle dress dancers, and grass dancers. Native drummers and singers will perform throughout the weekend. Over a dozen trade booths will offer jewelry, handmade crafts, and bead work. Traditional Native American food will be available for purchase including fry bread and soups. Sponsored by Lakeshore Museum Center. For more information, call 231-894-0342. Saturday, July 15: 10:00 am to 8:00 pm. Sunday, July 16 10:00 am – 4:00 pm. Fresh Coast Games is like no other CrossFit competition that you have ever been to! Come to beautiful Pere Marquette Beach for this three person (m/m/m or f/f/f) team competition guaranteed to test your fitness in ways that you just can’t when you’re inside the box. They plan to take full advantage of the sandy shoreline and maybe the water, too. But what about the barbells? Don’t worry, a max lift will be one of the day’s highlights. Included with registration is a one of a kind tank top so that you can show off those weapons of mass destruction as you strut up and down the beach this summer. In addition, each team will receive a ridiculous grab bag of goodies, as well as a raffle ticket for a few top secret giveaways. It’s going to be a party with loudspeakers fueling your workouts. There’ll be two large tents for athletes and guests to relax in between events. You are encouraged to bring your own pop up tent and beach towels. Vendor village will feature local businesses, supplement and equipment companies, and MichFit! This is an RX Competition, but they don’t want to turn anyone away from getting a great workout and suntan. If your team is unable to perform any of the movements to the standard, you will simply be ineligible for a podium spot. BAYWATCH – Don’t forget your short shorts and one piece! MUSCLE BEACH – This will be your opportunity to show off your strength. A portion of the proceeds will be going to The Old Newsies Goodfellows to aid in their mission of providing gifts to needy children in the Muskegon area. There will be a donation box for children’s toys. For more information, visit www.muskegoncrossfit.com/events or check out their Facebook page. Saturday, July 15 from 8:30am-10:30am, come to the Muskegon Farmers’ Market for a Big Farmers’ Breakfast! Enjoy pancakes, waffles, bacon, sausage, biscuits, bagels, bread, scrambled eggs, breakfast potatoes and more. Water will be served or beverages will be available for purchase. For more information, call (231) 724-6777. July 15 from 10:00am-4:00pm, the White Lake Historical Society will be sponsoring the 25th Annual Celebrate White Lake Day and Wooden Boat Show at the Municipal Marina and Goodrich Park. This free event features historical–environmental displays in addition to the boat show. For more information, call 231-894-4313. Join Maranatha every Saturday at 7:00pm for their summer concert series! All concerts are free and open to the public and feature artists like Meredith Andrews, Selah and Ellie Holcomb. For more information, visit vacationwithpurpose.org or call (231) 798-2161. Saturday, July 15 at 7:30pm, come to the White Swan Inn Bed and Breakfast for “Jazz at the Swan,” a fundraiser for the 8th Annual White Lake Chamber Music Festival! This special backyard event will feature the Tom Hagen Trio. and is a benefit for the 8th annual White Lake Chamber Music Festival. Tickets are only $15 and include wine and light hors d`oeuvres. A limited number of tickets are available in advance at the Arts Council of White Lake Nuveen Center, the White Swan Inn, and at artswhitelake.org. All proceeds will help underwrite the cost of the 2017 White Lake Chamber Music Festival, August 3-13. More information about the Festival, including a full schedule, is available at whitelakechambermusicfestival.com. You are invited to a Star Gazing Open House Saturday, July 15 at 9:22pm (sunset) at their observatory. There is no charge. They will be viewing the night sky with telescopes. As you wait for night, you might get a tour of the facility or a presentation. They’ll introduce you to amateur astronomy and have plenty of handouts on how to get started. If an open house is cloudy, it’s cancelled. If weather conditions are questionable, call (231) 777-1013 to find out the status of a particular event. Sunday, July 16 at 7:05pm at Marsh Field, come watch as the Clippers take on the Loggers. For more information, e-mail info@muskegonclippers.com. This entry was posted in Calendar of Events on July 10, 2017 by editor. This entry was posted in Fruitport Township on July 8, 2017 by editor. Why do we have blood? Where does it come from? –Norelle, Olympia, Wash.
Our bodies have many living parts, like skin, muscle, brain and bones. Blood helps keep these parts alive and healthy. The system that moves our blood around the body is sort of like a city’s postal service, said my friend Astrid Suchy-Dicey. Suchy-Dicey is a scientist at Washington State University who is really curious about blood. Her research helps people at risk for diseases. She said it first helps to know that blood is actually made up of different things: red blood cells, white blood cells, platelets, and plasma. If you think of your circulatory system like the postal service, mail carriers are the red blood cells. They transport important packages and letters (oxygen) over a vast network of streets and highways (blood vessels). About a gallon and a half of blood circulates through the human body, dropping off these deliveries, 24 hours a day. The strong heart muscle pumps blood out into the body. It’s working hard, too. The force needed to squeeze a tennis ball is similar to what you need to squeeze blood out of the heart. White blood cells help your body fight off infections. There are lots of different types of white blood cells with different jobs. Some of them fight off tiny bacteria and fungi. Some of them fight off viruses or other invaders. All of the white blood cells’ jobs have one common mission: keeping you healthy. Platelets help keep you healthy, too. Whenever you get a cut or scrape, these disc-shaped parts come to the rescue. Platelets help stop blood from flowing. They also help prevent you from losing blood and keep out invaders. Plasma is a watery solution with a few other things floating in it, like salt and proteins. It flows, carrying other cells freely along those streets and highways we know as blood vessels. As for your second question, Suchy-Dicey said that blood cells are produced in your bones. Specifically, they are produced in the soft fatty part inside your bones called bone marrow. Your plasma is formed mostly using water you drink. That’s why it’s really important to drink enough water each day, Suchy-Dicey adds. While on the issue of water, here’s a quick activity you can try to find out about how much blood your heart pumps in a minute. You’ll need a bucket of water, an empty bucket, and a small Dixie cup. Fill a bucket with about a gallon of water. Have a friend set a timer for one minute and see how many little cups of water you can move to the empty bucket. Each time your heart beats it moves about a small Dixie cup’s worth of blood. It takes our heart about one minute to pump about a gallon of blood. Can you move the liquid faster than a heart? Try it out sometime and let me know how it works. Ask Dr. Universe is a science-education project from Washington State University. Submit a question of your own at askDrUniverse.wsu.edu/ask. This entry was posted in Dr. Universe on July 8, 2017 by editor. Art Cats Gallery is proud to feature the artwork of Mike Kraus. His pieces explore nature and our interaction with it. Using traditional paint on canvas, his work captures the vibrancy and solitude of our natural surroundings. “My focus is to extract the emotions of each scene and transform it on canvas by emphasizing the details that make the vision unique.” say Kraus. Visit Art Cats Gallery Tuesday – Saturday between 11am – 5pm. This entry was posted in Local Writers on July 7, 2017 by editor. June 29 – July 4 come to the White Lake Area to take part in the West Michigan Wine and Jazz Festival! This is a five-day festival, based at The Book Nook Java Shop/Best Cellars Wine Bar in Downtown Montague. The festival will star leading solo and group musicians from the mitten state, as well as the national scene, who will play during evening Happy Hours and dinners. There will also be special Showcase concerts at various local venues. Highlights include a public concert at the Whitehall Gazebo in Goodrich Park followed by July 4th fireworks! Festival passes are $60. Tickets for individual shows vary. Get details and buy tickets at www.westmichiganwinejazz.com. For more information, call (231) 894-5333 or e-mail info@thebooknookjavashop.com. The 8th annual Muskegon Rockstock will be held on July 3-4 at beautiful Heritage Landing! This popular festival began in 2008 as a way to showcase the local music scene and has been getting bigger and better every year. The mission is to provide a rockin’ family event at a reasonable price that supports all things local. This year’s 2 day 4th of July celebration will feature lots of great food, Budweiser and Craft Beers, vendors, tried and true music and NEW this year, KIDSTOCK a Kangaroo Palace special event for kids of all ages! Kicking things off and back by popular demand are the Crazy Babies – Ozzy Rebourne and Let There Be Rock (early AC DC) with The After Effect opening the show at 5:00pm on Monday July 3. Spike the Media will start the 4th of July party on Tuesday, featuring The Echoes of Pink Floyd with their amazing laser show kicking off the always brilliant fireworks show at the end of the event. Tickets are $5 per day and will be available at the Heritage landing Box Office each night starting at 4:30pm or you can purchase them online and pick up at will call. -Active Military and Veterans FREE and HONORED. ​-Gates open at 5:00pm each night, with an amazing Fireworks finale at dusk on the 4th of July. A Portion of the proceeds will benefit NO MORE SIDELINES. See their website or facebook page for all the details at www.muskegonrockstock.com. The “Pack the Pier” boat rally and raft-up is happening Tuesday, July 4! How many boats can we pack into the North or South Breakwater Cove? We’ll find out while enjoying “The Lake Effect!” Bring your coolers, rafts and loving spirit as you celebrate the 4th of July. The Deck is Muskegon’s great beach restaurant and will provide music and refreshments. They’re a short walk from the South Breakwater Cove. Anchor and enjoy a great Michigan tradition! For more information, visit www.lakeeffectboating.weebly.com. Beginning at 10:00am, the White Lake Area 4th of July Parade will travel from Whitehall City Hall to Downtown Montague. Over 100 entries are involved in this family fun, annual parade. Fireworks begin at dusk and are viewable in both downtown areas! For more information, call (231) 893-4585.
right outside the Muskegon Lake channel walls? Discover the hidden history of Muskegon! This cruise narrates fun facts while you enjoy the beautiful shorelines of Muskegon Lake and Lake Michigan. Snacks, soft drinks and a full bar are available for purchase. The cost is $25 per person. Please arrive a half hour before sail time. For reservations or more information, call (231) 728-8387. Tuesday, July 4 from 8:00pm – 11:00pm, board the Port City Princess for a 4th of July Fireworks Cruise! Enjoy a spectacular view of the fireworks over Muskegon Lake! Dinner is a good old fashioned picnic meal of ham, fried chicken, apple pie, ice cream and more! Reserve your spot now, this favorite fills up fast! Visit to portcityprincess.com and click on ‘Reserve/Pay’ or call 231-728-8387 for more information. Tuesday, July 4 at dusk, watch Muskegon’s fireworks from the best seat in the house aboard USS LST 393 Veterans Museum for just $5. Bring a chair and sit on any of three decks. Buy refreshments, enjoy the sunset and then watch the bombs bursting in air. Parking is extra. For more information, visit www.lst393.org. The Arts Council of White Lake is keeping things fresh this summer with art displayed on crispy clean skateboard decks! Local adults and youth have come together to create their own custom decks that will look great on display and even better beneath your feet! Roll over to The Nuveen Center July 6 – September 1 to enjoy this exhibit. There will be an opening reception July 6, from 5:00pm – 7:00pm with refreshments sponsored by Fetch Brewing Co. The Arts Council of White Lake provides numerous opportunities to view, listen to, create and learn from the arts, and gives support and encouragement to artists and arts organizations. Hours are 10:00am – 5:00pm, Tuesday – Saturday. For more information call 231-893-2524 or find them online at www.artswhitelake.org or on Facebook. Thursday, July 6 and Friday, July 7 at 7:05pm at Marsh Field, come and watch as the Clippers take on the Loggers. For more information, e-mail info@muskegonclippers.com. Auditons will be announced soon! For more information, visit the website below or call (231) 894-4048. The Lakeshore Art Festival is now in its 5th year and bigger and better than ever! July 7-8, as many as 300 fine art and craft booths will line Western Ave. and Hackley Park. During the festival, downtown Muskegon will be packed with live and interactive arts, street performers, musicians, magicians and more. The Lakeshore Art Festival was recognized by Sunshine Artist Magazine as one of the top 100 art festivals in the country! Check back for more details as they become available or e-mail artfest@muskegon.org. Friday through Sunday, July 7 – 9, fishermen of all ages are invited to be part of the Muskegon Lumbertown Challenge! The tournament will be held at Great Lakes Marina, featuring “no boundaries” fishing in Muskegon. This is an open division tournament, no observers, open communication with a catch 15 weigh 5 fish limit each day. The Big Fish is 100% payout with separate pots for the Open Division, the Women’s Division and the Kids’ Division. The Women’s and Kids’ tournament will benefit the Terry Weber Michigan Stinger Memorial and will take place on Friday, July 7. 10% of the entry fees will go to the memorial fund. The captains meeting for both events will be held at Great Lakes Marina on Thursday, July 6 at 7:00pm. Registration starts at 5:00pm. The results and prize ceremony for the main event will be held Sunday afternoon. For more information, call Don Johnson at 231-206-0048. July 7 from 6:00pm – 8:00pm, you’re invited to the USS Silversides Submarine Museum for the lecture, Code Talkers of World War II! This special lecture will feature Peter MacDonald (born 1928), a Native American politician, the only four term Chairman of the Navajo Tribe and a member of the U.S. Marine Corps in World War II who served as a Navajo Code Talker. McDonald will talk about the critical contributions that Native Americans made to victory in World War II. For more information, call (231) 755-1230. Friday, July 7 from 6:00pm – 8:00pm, come to the Muskegon Center for the Arts at The Red Lotus Gallery for the opening reception of their Steampunk Art Exhibition! Every month there is a different display and art themed event. The art display lasts for the entire month and you can meet and talk with the artists and view the creativity of local awesome art work during the reception. Refreshments will be provided. For more information, visit www.muskegonca.org or www.facebook.com/redlotusgallery. Friday, July 7 from 7:00pm – 9:30pm, come aboard the Port City Princess for Beers, Brats & Bluegrass! Slug back a few beers, scarf down a few brats, and then get your dance on with the best party on the Great Lakes! The cost is $35 per person plus a $3 surcharge. For reservations or more information, call 800-853-6311. For more information, call (231) 894-4048. At midnight during each full moon from May through September, Guy’s Ultimate Kayak Service will be guiding a “Full Moon Float” down the Muskegon River! They begin at the Creston Rd. launch and end at Veterans Memorial Park. The cost is only $20 per person and includes a kayak, paddle, life jacket and a glow stick. The dates for 2017 are May 10, June 9, July 8, August 5, September 8 and October 6. All the full moon floats depend on mostly clear skies and take 1-2 hours. Call Guy to reserve a kayak today at 231-740-0227. Saturday, July 8 at 8:00am, come to Harbor Towne Beach to “Stand Up for the Cure!” Have fun and save lives with a day of Stand-Up paddling in support of the of the Susan G Komen Foundation. There will be professional SUP instructors, fun races, happy hour beer, wine and a delicious lunch as part of this fantastic event! Standup event proceeds go to the local affiliates of Susan G. Komen. Each affiliate uses 75% of the net proceeds to fund local life-saving education, screening, diagnostics, treatment and survivorship programs. The remaining 25% is invested in global breast cancer research. You can learn more about the local affiliates’ programs by visiting their pages and more about Komen’s global research at www.Komen.org. Saturday, July 8 at 10:00am, everyone is invited to the Heykoop Veteran Memorial Car Show, a benefit supporting veteran suicide awareness and prevention! Your $5 entry includes a door prize ticket and a voting card for the show. The cost to participate in the show is $10 with your chance at one of 3 trophies that are up for grabs. There’ll be kids’ activities like a bounce house, games, a photo booth and face painting, as well as a silent auction, raffles, door prizes, live music a pig roast and bonfire! All proceeds will be donated to Mission 22. The location is just north of Babbit’s Sports Center on Getty St., so watch for the signs. For more information or show car registration please e-mail heykoopVeteranMemorial@gmail.com. July 8 from 10:00am – 3:00pm, bring the whole family to the Muskegon Museum of Art for Super Saturday: Michigan Indian Tribes! This free family fun day features special guided tours of the Edward S. Curtis exhibition, film screenings and craft activities. Admission is free and so are the activities. 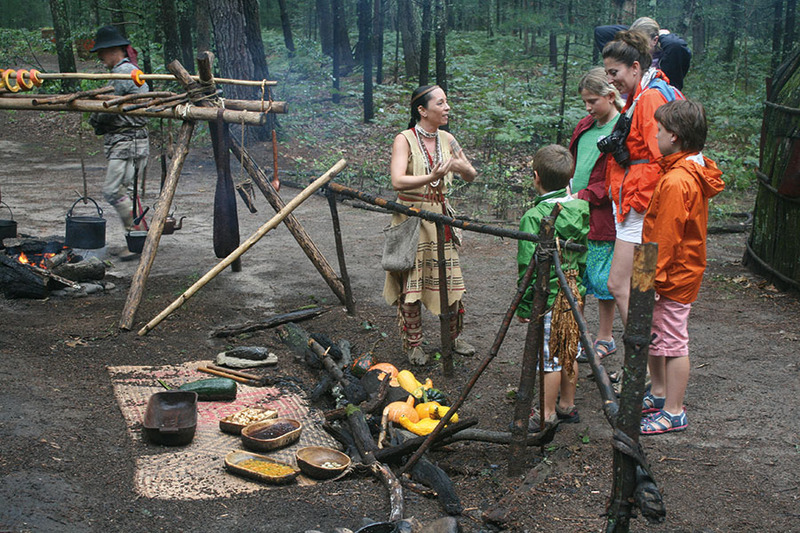 Explore and celebrate the rich heritage and culture of the many tribes that are a founding part of Michigan. For more information, call 231-720-2570. Saturday, July 8 and Sunday, July 9 at 7:05pm at Marsh Field, come watch as the Clippers take on the Green Giants. For more information, e-mail info@muskegonclippers.com. Join Maranatha every Saturday at 7:00pm for their summer concert series! All concerts are free and open to the public and feature artists like Meredith Andrews, Selah and Ellie Holcomb. This week it’s the Matthew Brothers. For more information visit vacationwithpurpose.org or call (231) 798-2161. The purpose of the center is to rehabilitate sick, injured and orphaned raptors and return them to the wild in a healthy condition. The center is open to the public from June through October two days per month, the 2nd Thursday and 2nd Sunday of each month from 1:00pm-4:00pm for tours. No admission fee. When you visit the center you will see a number of different species of raptors, including eagles, owls and falcons. In addition to the birds, they have hands on activities to learn more about raptors. They are handicap accessible. Please call in advance to be sure they are open. Brought to you through the generosity of the A. J. Flogge Performing Arts Fund of the Community Foundation for Muskegon County. This entry was posted in Calendar of Events on July 5, 2017 by editor. The grant was awarded for the Grand River Explorers Trail – Stearns Bayou Connector and is payable over two years. Over the past two decades, a primary focus of the Ottawa County Parks Department has been its $41 million Grand River Greenway Initiative, with the goal of protecting thousands of acres of natural lands, creating green infrastructure, developing new recreational opportunities, and connecting communities. “So far, $20 million in mostly public funding has been invested to preserve over 2,400 of land and create 13 parks and open spaces along the Greenway. Over the next five years, Ottawa County Parks proposes to invest an additional $21 million to acquire 1,000 acres of land and construct 27 miles of new multi-modal pathway,” said Ottawa County Parks Director John Scholtz. 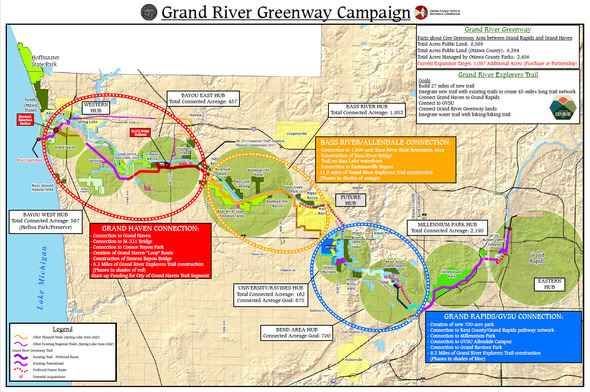 This investment will create recreational, educational, conservation and historic attractions by protecting some the highest quality land remaining along the river, connecting the greenway properties to each other, and completing the most critical remaining unfinished link in the regional pathway system – a trail, the Grand River Explorers Trail, connecting Grand Rapids, Grand Haven, and Grand Valley State University. This entry was posted in Ottawa County on July 5, 2017 by editor. Right to Life of Michigan is encouraging Governor Rick Snyder to sign legislation to create a Choose Life license plate in Michigan. A Choose Life license plate would cost $35, with $10 paying for the cost of manufacturing the plate. The extra $25 in fees would go to a Choose Life Michigan fund. Grants from the fund will be given to specific projects to promote adoption and other alternatives to abortion, provide practical help to pregnant women, and suicide prevention programs. Legislation to create the Choose Life plate passed in a bipartisan 65 to 43 vote in the Michigan House on May 25. It first passed the Senate on April 28 by a 25 to 11 vote and received a final procedural vote on June 6. Choose Life plates would first be available in 2018 if signed into law. The Secretary of State must approve the design of the new plate and then work through the manufacturing and distribution process, which takes approximately nine months. This entry was posted in Right To Life on July 2, 2017 by editor. Why does meat get brown on the grill? –Christina, 9, Seattle, Wash.
He’s really curious about animal nutrition and the meat we eat. Busboom explained that meat is muscle. It has a lot of different proteins. These proteins have different jobs. One of them delivers oxygen to the cells that make up muscles. It’s a protein called myoglobin. Believe it or not, the red liquid we see in a package of meat comes primarily from myoglobin. The more myoglobin there is in a muscle cell, the redder the meat will look. Myoglobin is a big part of why meat is red in the first place—but it’s also part of the reason it turns brown on the grill, too. Like almost everything on our planet, a hamburger is made up of atoms. As you may know, atoms get together to form molecules. These parts are arranged in ways that give things certain colors, tastes, and smells. As is often the case when we heat up something, its atoms and molecules often start to move, or vibrate faster and faster. Then they transform. When we heat up the hamburger meat, the myoglobin structure begins to change. Myoglobin loses its ability to bind onto oxygen. There’s also a change in one of the iron atoms at the center of the myoglobin. These changes are happening on very small scale. But we can actually see the changes as the red meat transforms into a juicy brown hamburger patty. It turns out color isn’t always the best sign that a burger is ready to eat. Busboom said sometimes a burger won’t brown on the grill. Even if it’s fully cooked, it will stay red. On the flip side, sometimes a burger that is brown isn’t actually cooked. This is because there may be some other chemical factors going on here that influence color. That’s why it’s really important to use a thermometer and make sure your meat is safe to eat. Not only does a burger’s chemistry influence color, but also its taste and smell. When we heat it up, proteins and sugars in the meat start to break down. It was the French chemist Louis Camille Maillard (my-YAR) who discovered the way this works. When the Maillard reaction happens, it creates thousands of new chemical compounds that give meat flavor. Yes, there’s a whole bunch of science happening right there on the grill. I suppose you might even say the grill master is a bit of a scientist. Can you think of other kinds of science that go into building the perfect burger? Tell me about it sometime at Dr.Universe@wsu.edu. This entry was posted in Dr. Universe on July 1, 2017 by editor.